FIIs were net buyers of equity on the first four trading days, but were net sellers on Fri. Mar 29. Their total net buying was worth Rs 61.4 Billion during the week. DIIs were net sellers of equity on Mon., Tue. and Thu. (Mar 25, 26 and 28) but net buyers on the other two days. Their total net selling was worth Rs 4.3 Billion, as per provisional figures. For the month of Mar ’19, FIIs were net buyers of equity worth a massive Rs 323.7 Billion – their highest net buying in a month since Mar ’17; DIIs were net sellers of equity worth Rs 139.3 Billion – their highest net selling in a month since Mar ’16. India’s Current Account Deficit (CAD), at US $16.9 Billion during Q3 (Oct-Dec ’18), widened to 2.5% of GDP from 2.1% a year ago due to a higher trade deficit. India’s fiscal deficit (gap between expenditure and revenue) from Apr ’18 to Feb ’19 was Rs 8.51 Trillion – 134.2% of the budgeted amount of Rs 6.34 Trillion for FY 2018-19. After a brief dip towards its rising 20 day EMA on Mon. Mar 25, the daily bar chart pattern of Sensex made another attempt to cross above the upper edge of the upward-sloping trading channel on Fri. Mar 29. This time, the effort was almost successful. 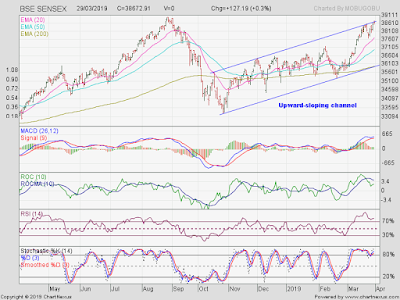 The index closed marginally above the channel, but formed a small ‘doji’ candlestick – showing indecision among bulls and bears on the last trading day of FY 2018-19. Daily technical indicators are looking bullish and overbought. MACD is moving sideways above its rising signal line in bullish zone. ROC has crossed below its 10 day MA and dropped from its overbought zone. RSI and Slow stochastic are inside their respective overbought zones. All four indicators are showing negative divergences by failing to touch higher tops with the index. Sensex is trading well above its three rising EMAs in a bull market. However, a pullback towards the ‘gap’ zone (between 37106 and 37231) formed on Tue. Mar 12 remains a possibility. After inventory pile-up at auto dealerships, there is now news of inventory pile-up at FMCG dealers and reluctance of distributors to stock more. Year-end considerations may be part of the reason, but there are definite signs of rural distress. Here is an interesting stat: FIIs were net buyers of Indian equity during the month of March every year for the last 10 years. (They were net sellers in Mar ’08 and Mar ’09.) So, their net buying in Mar ’19 is not a surprise – but the amount of buying is. 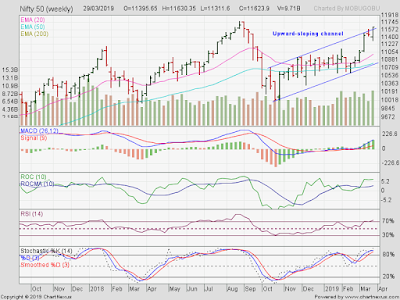 The weekly bar chart pattern of Nifty closed higher for the sixth week in a row, on the back of strong FII buying. More importantly, the index managed to close just above the upward-sloping trading channel. The breakout above the channel isn’t a convincing one yet. Follow-up buying is required to propel Nifty to a new lifetime high. That shouldn’t pose a problem as long as FIIs remain bullish. Weekly technical indicators are looking bullish and overbought. MACD is rising above its signal line in bullish zone. ROC is above its 10 week MA, and is moving sideways inside its overbought zone. RSI has entered its overbought zone. Slow stochastic well inside its overbought zone. Nifty’s TTM P/E has moved up to 29.01, its highest level during the month and well above its long-term average in overbought zone. The breadth indicator NSE TRIN (not shown) has dropped well inside its overbought zone. Some index correction or consolidation can be expected. Bottomline? Sensex and Nifty charts are just above the upper edges of their respective upward-sloping trading channels, and may face some correction or consolidation before moving up to touch new lifetime highs. Use dips to add.